Do not miss this chance to save more than $5000 on the purchase of premium-quality of E-commerce design templates. 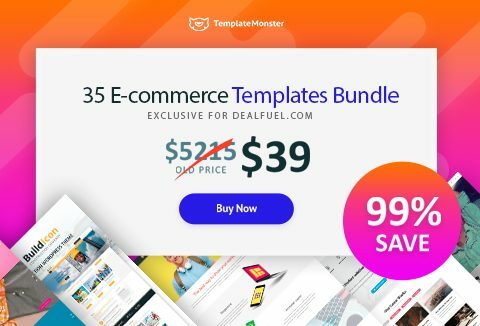 Save yourself time, effort & money with this bundle of 35 Ecommerce templates. Buy now for just $5215 $39 only on DealFuel for a limited time! The bundle includes an impressive collection of 35 E-commerce templates that are ready to be used for the quick launch of a range of industry-specific sites. The themes that are added to the bundle are ready to be applied to multiple niches, including personal and corporate sites. As part of a special deal for dealfuel.com, the cost of the deal is slashed by 99%. You can download this bundle of 35 E-commerce design templates at the price that's cheaper than one theme. The full price of all items that are bundled in one pack makes up $5215. But, You can download the entire pack for only $39. The product can be used for personal and commercial purposes with unlimited numbers of Projects. Cannot be sublicensed, resold, shared, transferred, or otherwise redistributed on its own or upload to any online & offline database. Attract customers naturally with this beautiful bundle of ecommerce design templates. At A Deal Price Of $39 Only!